The sun will come out tomorrow…but when the sky opens up, you’ll be glad to have your bright orange Be the Voice Umbrella to keep you dry. 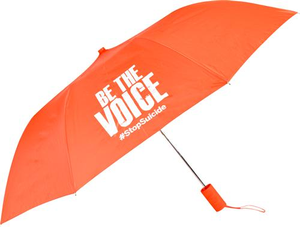 Featuring our “Be the Voice” logo, and the #StopSuicide hashtag, this cheerful rain-stopper will get you through the storm. Great to have for an AFSP Out of the Darkness Walk.